All Ceramic Crowns – a Life Changing Event! We perform a considerable number of cosmetic dentistry procedures in our office in Orange, CT. We always get excited when our dental work makes a life changing impact on our patients. To us, there is nothing better than knowing that our patients can smile again with pride. We recently completed this case of all ceramic crowns on one of our patients from Milford, CT. After a hockey accident as a teenager where he nearly lost his two front teeth, he lived with brown and poorly shaped teeth for nearly thirty years. He was the first to admit that he never smiled in public. After we discussed all the options for this front teeth, we decided on an approach involving all ceramic crowns and bonding. 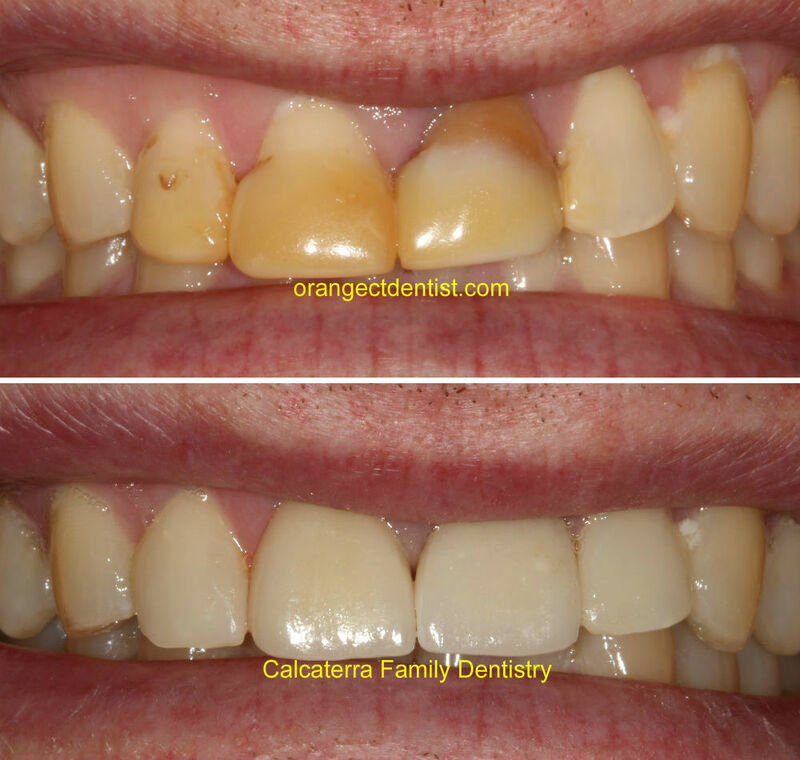 Before and after photos on our patient from Milford, CT. Dentistry and photos by Dr. Nicholas Calcaterra. Clicking on the image will show a high resolution version. He went from never smiling to smiling from ear to ear! This truly was a life changing event for him! To learn more about our services, please visit this page to request an appointment or call (203) 799 – 2929.